Do you love fishing but you love hunting but you can’t decide which trip you want to do? Well Great News! Now you can do them both in one trip. 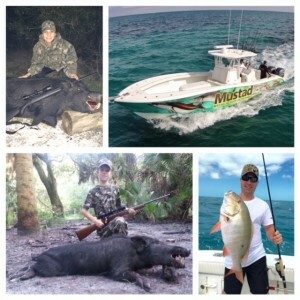 4 Night Stay & 2 days fishing in the Florida Keys aboard our 36′ Yellowfin with triple 250’s & 2 Hog Hunts in Okeechobee, Florida. Day 1: Arrival in Marathon, Florida Keys. Day 2: Fish 3/4 day on the Ocean Wrecks or Reef. Day 3: Fish 3/4 day in the Florida Bay/Gulf of Mexico. Day 4: Depart the Keys and arrival at Hunting Camp in Okeechobee, Florida and start afternoon Hog Hunt at 3pm. Day 5: Morning Hog Hunt and depart camp at 1:00pm.